Dental surgery is a field of dentistry that deals with surgical treatment within the mouth and its adjacent areas. Each surgery is preceded by a surgical consultation and diagnostics. Our clinic uses only state-of-the-art, top grade diagnostics devices, and our procedures are performed with particular attention to the principles of asepsis and antisepsis. This makes our surgery procedures effective and safe for the patient. Our clinic offers comprehensive services in dental surgery. 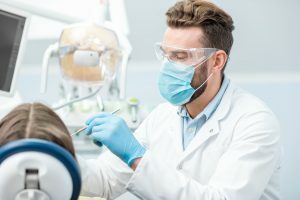 Surgeries are carried out by dentist Beata Świątkowska, Consultant in Implantology and Dental Surgery, with many years of extensive experience in the field. The progress of pain management medicine has been so enormous that a surgery does not involve the risk of pain nowadays. To achieve the effect of painless surgery, our clinic relies on local anaesthesia with the modern system The Wand, sedation or general anaesthesia. The doctor and the patient jointly decide which type of anaesthesia to choose. The Wand system allows local anaesthesia to be delivered extremely gently, in a way that is virtually unnoticeable for the patient. 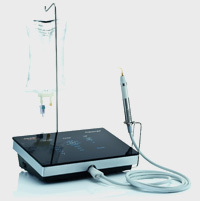 The anaesthetic is administered by a microcomputer at a rate ensuring that the patient does not experience a feeling of tissue expansion or pain. Patients who tend to experience surgery as an enormous stress can benefit from analgosedation, which complements local anaesthesia. Sedation eliminates patient’s anxiety, excessive tension and unwanted reflexes, and the drugs administered minimize the risk of swelling. During a surgery, a surgeon interfering with hard tissues uses the latest generation of piezoelectric devices which minimize the traumatisation of tissues, resulting in a faster healing process and almost completely excluding the risk of postoperative complications. Advanced caries – if it is obvious that conservative treatment will not be effective. Prosthetic indications – eg. teeth set outside the dental arch, which can not be corrected by another method. Pathologically changed tooth roots, giving recurrent inflammation. Orthodontic indications – eg. teeth excessively crowded in an arch or growing crooked. Impacted teeth are teeth which have remained within the bone and are not visible in the mouth. Some patients may also have supernumerary teeth (milk or permanent). This may negatively affect the direction of growth of neighbouring teeth and cause pain. A procedure to cut off the apex of a tooth’s root and remove diseased tissue (eg. a granuloma, cyst or abscess). If the problem concerns only the root, the cavity is refilled with bone substitute material, which prevents the extraction of the entire tooth. Resection of root tips is performed when root canal treatment does not produce the desired results and the inflammatory change cannot be treated with a different method. This procedure is performed on multi-root teeth (usually lower molars). It involves the removal of one or more roots, along with a part of the tooth’s crown. The healthy part of the crown and roots that are not affected by inflammation remain, and the defects are restored with a crown-root insert, on which a crown is placed. Hemisection is performed to prevent the extraction of a tooth. Indications for the procedure include fracture of the crown and the root, unsuccessful endodontic treatment, bone loss and pathological changes that can not be treated endodontically. This procedure is performed on multi-root teeth (molars). It involves the removal of one of the roots. Radectomy is performed when one of the roots has inflammation while the remaining roots and the crown are healthy. Indications for radectomy are pathological lesions of the root of a molar, which can not be treated endodontically. Our clinic specializes in guided bone regeneration (GBR). Using biomaterials and collagen membranes, we reconstruct the missing part of a bone which restores the physiology of the bone base before implant placement or prosthetic work. Biomaterials we use are safe, top quality materials derived from animal bone tissue (Bio-Oss). Their structure is similar to human bones, so we do not need to use bone grafts from patient’s own bone. Once applied, the biomaterial is covered with a resorbable collagen membrane (Bio-Gide) which prevents the graft from moving and improves wound healing. In our surgical procedures, we use the Mectron Piezosurgery device which enables us to cut bone extremely precisely. The device emits controlled ultrasonic micro vibrations, making the procedure much less invasive than when traditional surgical instruments are used. In addition, with this equipment hard tissues can be cut selectively, minimizing the risk of nerve and vascular damage. An important advantage from the surgeon’s point of view is that with Mectron Piezosurgery tissue can be cut without bleeding. This means great visibility in the operating field, translating into the precision of the surgeon’s moves. It also measurably reduces healing time. We also use Mectron Piezosurgery for our dental implantation procedures. *The remaining dental surgery procedures will be priced individually. To arrange an appointment please visit our office or give us a call.